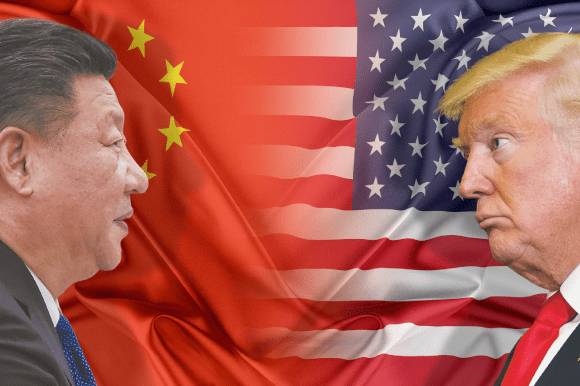 Trump vs China tariff wars are dominating the headlines – should we be worried? The first tariffs were introduced by Trump earlier in March for 25% on steel and 10% on aluminum, but exempting Canada and Mexico. Then things started to heat up in this past week with China retaliating early in the week with tariffs on 128 US products – then Trump responding with 25% tariffs on TVs, then China putting tariffs on US’s main export to China – agriculture and pork. Then Trump saying that he would consider $100B more in tariffs. Also in the news was Trump attacking Amazon. So what does this all mean for the market? Based on the chart patterns, I’m inclined to expect a bounce. It looked like we were in the process of getting a bounce in the markets with the markets roaring higher from the lows – but then it get smacked right back down as Trump announced he would consider an additional $100B worth of tariffs on China late in the week on Thursday night. So should we be in a state of fear? From a headline perspective – yes. But from a pattern perspective, I do see a completed 5 wave move down with a wave 1 bounce followed by an a-b-c wave 2 drop. Certainly the wave 2 is a bit stronger than I would have expected – but the market did show some green in the last hour of trading on Friday. While a gap down is possible into next week, I’m inclined to say a bounce is more likely. So if I were to use the stock charts to try to guess the news, I would guess that news will come out saying that chances of a trade war are reduced in some way. The pattern above is on an hourly chart – and can be seen zoomed out below on the daily chart. 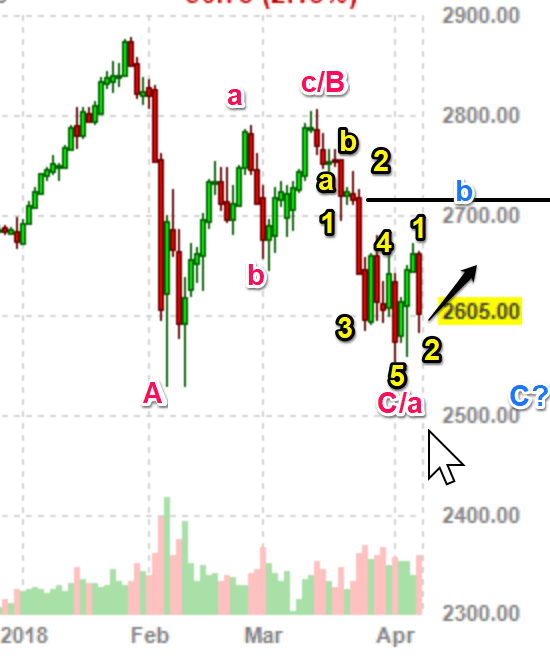 If the count is correct, it would suggest a rally over 2700. It sems there has been significant support just below 2600 as evidenced in most of the last two weeks in this zone but often bouncing above and not spending too much time in this region. The Nasdaq appears to have completed an ending diagonal on April 4 – after a giant wave 4 bounce on March 26. The c of wave 2 pullback on April 6 Friday appears positioned for a bounce as well. So both S&P and Nasdaq appear aligned. So while the world is fearful of a potential trade war between China and the US – I’m inclined to that news will come out saying that things are actually OK.